Life lately has been centred around the home, no foreign vacations planned for this month unlike previous years when we've escaped the February glooms and headed off to enjoy winter sunshine in Greece. There's been plenty of rain but, fingers crossed, we have so far escaped the snow that has blanketed Paris this week. The sun has been out occasionally and whilst taking Fleur out for a " tiddle time" early one morning the Senior Partner captured these scenes in the lane. 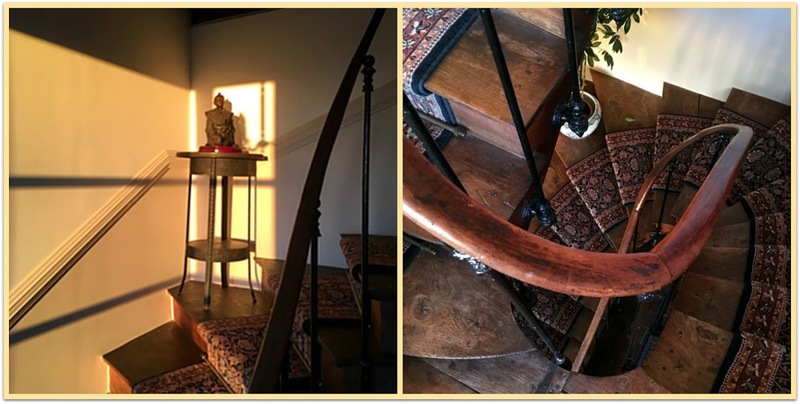 A low lying sun created beautiful shadows on the staircase and turned the spotlight onto one lonely daffodil, a victim of inclement weather earlier in the week, brightening the kitchen windowsill. Life's culinary influences have lately come from some unusual places. 1. 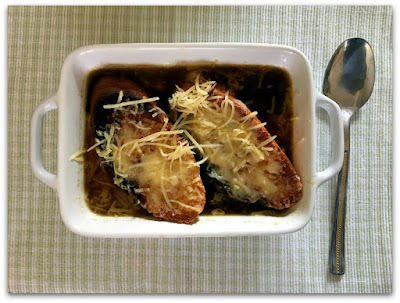 A FB post from our nephew, who is coming with his girlfriend to visit us next week, prompted the SP to make a big pot of Delia Smith's French Onion Soup for our lunch and to freeze ready for company. Just look at those mouthwateringly crunchy garlic croutons smothered in melting Gruyere cheese floating on top of the soup! See how he tortures spoils me, I'll never regain my sylph like figure at this rate. Click here for the recipe @ Delia online. 2. After a busy day I was looking for something fast and easy to make for supper. 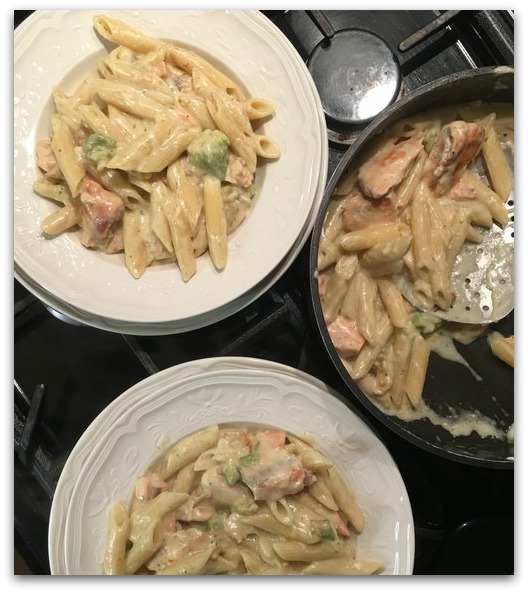 Pinterest came to my aid and in no time at all penne pasta with steamed salmon fillets in a creamy broccoli cheese sauce was on the table. 3. I know I'm not alone in owning too many cook books (about 50 at the last count). I enjoy reading a cook book almost as much as I enjoy reading a novel, even if I have no plans to make anything. Mrs Charles Darwin's Recipe book (revived and illustrated) isn't just a collection of some of her wonderful original recipes (written in her own hand) it is also a great read giving detailed insights into the lives that Emma and Charles led. It so happened that I was looking through the Recipe book recently practically drooling over the beautiful photography and illustrations when I came across this recipe for Burnt Rice and decided to give it a try. Simmer the rice in the milk and cream until it is completely soft, takes between 20 and 30 minutes, stir occasionally to prevent the rice catching on the bottom of the pan. Remove from the heat, add the butter, 1 teaspoon of sugar and the egg yolks. Whip the egg whites into soft peaks, gently fold into the rice mixture. Pour into a shallow ovenproof dish and bake for 20 to 25 minutes. Sprinkle the remaining sugar evenly over the top, place under a hot broiler/grill for a few minutes. Note from me: watch it carefully or it might become too burnt, like mine did. I also used golden caster sugar which perhaps was a mistake, it was delicious nevertheless. Mrs D's book has not been returned to the main bookshelf to gather dust but has now taken up pride of place amongst the kitchen cookbooks that I refer to most often, it's my new favourite and still available on Amazon if you'd like to try Emma's recipes for yourself. What a delightful post - the sunny faces of daffodils and wonderful recipes - they look so yummy I must try them sometime - and the cookbook is a must. And now I've got my days straightened out I think I'll be ok. Hee hee. Always a treat to see your photos each week and read about what you have been doing. Love old cook books, found a 1923 edition of The Family Herald Cook Book with notes and recipes added on cards and notepaper throughout. It was published in Montreal. What I love is the handwritten notes - McLeans Handwriting. Lovely post! 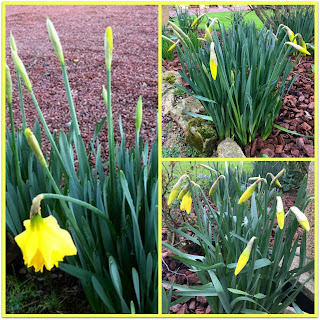 The daffodils are beautiful and offer hope of spring. Thank you. Wishing you well! Who needs to travel when you have that lovely light and daffodils right there at home! Burnt rice sounds delicious...and the cookbook an excellent read...I’ve never even given a thought to a Mrs Darwin and now I really want to know more. A wonderful post, Maggie. Those culinary delights look very tempting. The hints of Spring I am sure are welcome, especially given the bad weather France has suffered through this Winter. Hi Maggie ! I am trying the understand the concept of a mosaic.Would the first picture in my post serve as a mosaic? If not please do explain to me the definition of a mosaic. Thanks. You have posted some delightful pictures and thoughts along with some mouthwatering dishes !Enjoyed the culinary tour. I love that spiral staircase...we've always wanted a home with one! And the sunshine looks welcome during this cold winter month. I love cookbooks too and don't really need a new one but I'm going to look this one up. I get so many recipes online now...quick and easy! Enjoy your day! Happy MM! Have a wonderful Valentine Month. There is something special about the early morning light. I just wish I'd see the sun one day!!! I love cookbooks and like you, read them like a "real" book. I've been downsizing (although you can't tell by looking) and the cookbooks were the first to go. I saved my favorites. Still have too many, but great reading (and cooking). Happy Monday! Thanks for hosting. Your lovely home and surrounding area look so beautiful in the late day(?) sunshine. Glad you've been spared the heavy snow. The soup looks good, pasta too, but as you say these delicious meals are often not kind to our somewhat lazy bodies - oh to be young and moving easily again, bending and kneeling without aches and pains, haha! Lovely post Maggie - any plans for travel later? 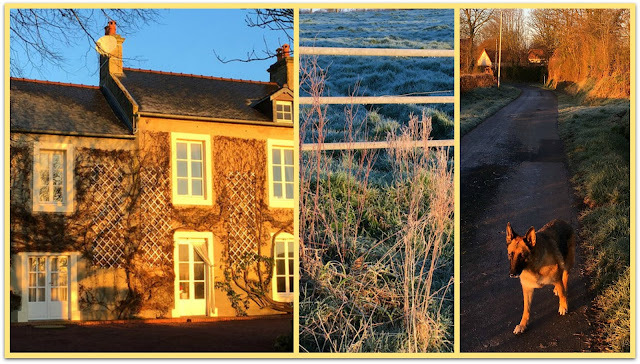 Have fun with your visitors - lucky things seeing Normandy! 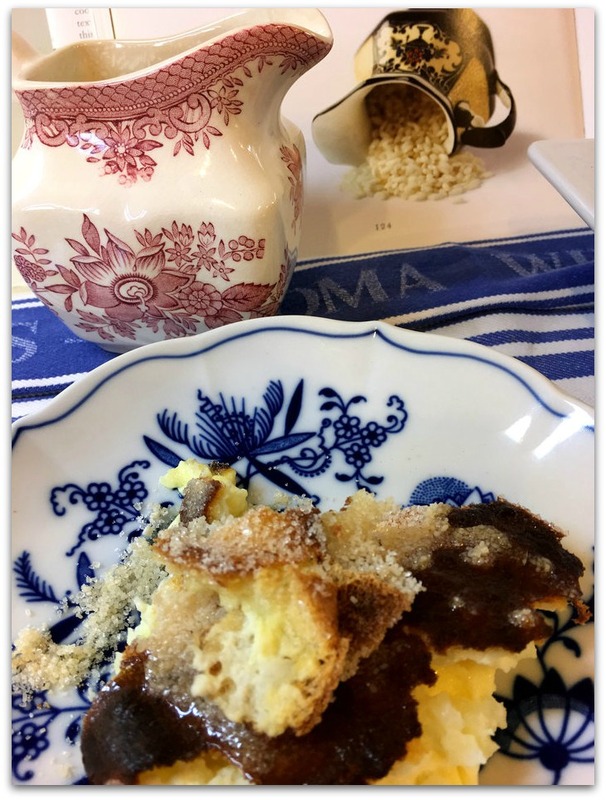 How fun to use Mrs. D's cookbook and realize it's not just an interesting item! I love cooking in winter time -- It feels nice to have the stove going. This all looks good, especially that pasta! Beautiful light in your photographs, Maggie. 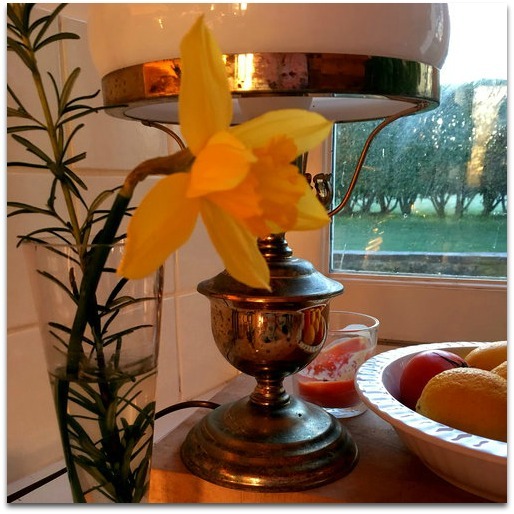 The lone daffodil is doing her best to provide cheer in your kitchen. Your culinary features have me drooling and thinking about what's for lunch today. Nothing quite so lovely as the dishes you've shown, I'm afraid. Do you have the urge to travel someplace sunny and warm? February is always that month for me; I just want to escape! Thanks again for hosting MM. Mrs Darwin's cook book - how fascinating that must be to delve into. Here in Australia we have the Country Women's Association cookbook, which is a standard, at least for my and older generations. Keep warm and enjoy the splashes of sunshine. Maggie - I liked your description of the daffodil as victim of the inclement weather - I used to harvest most of our peonies before rainstorms because I knew they would be dashed to pieces! Our husbands are so good to us, even if it means we have to work in an extra walk or two to maintain those svelte bodies! Your mosaics look delightful today. I have just had my supper and reading you delicious recipes made me hungry again. Pinterest has great recipes, but I think Mrs. Darwin's bunt rice sounds so good. Enjoy your month staying home this year.